Yesterday, I talked about the benefits and basic steps to setting up a ‘listening station’ using iGoogle. Today, I’m going to give you nine different sites where you can setup feeds to add to your station. I’ll also take you step-by-step through the process with the first two or three so you’ll get the hang of it. To make things easier, I’m going to pretend I’m setting up a listening station for someone that runs a blog on the Mercedes S-Class sedan. 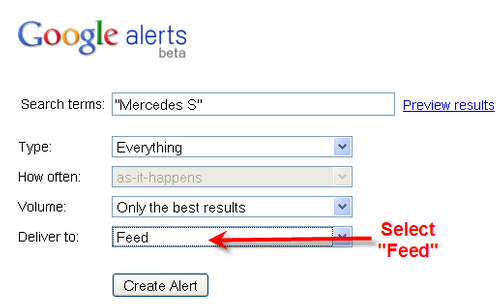 Go to: Google Alerts and login using your Google ID. In the next window, you’ll see a list of your current alerts. Click on “Feed” to access the RSS Feed. On the next page, highlight the full address in the browser bar and copy it (Edit>Copy or CTRL+C), then paste into the Add feed window in iGoogle. (See Part 1 for Instructions on how to access the feed window). Repeat for as many additional Alerts you wish to setup. You could, for example, setup alerts for your Company name, your employees names, your competitor’s names, company names and website as well as the main keywords for your market. 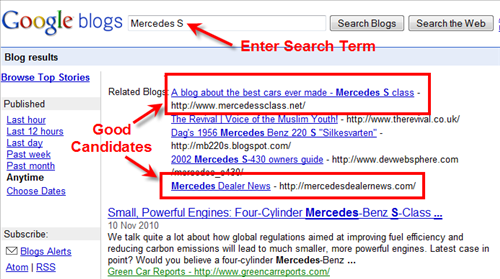 Go to Google Blogs and enter your search term(s). Look for any relevant blogs. 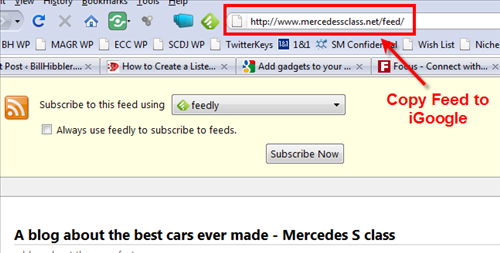 In the image below, you can see I found a couple of prime candidates for our Mercedes S-Class blogger client. Click on the links of any relevant blogs you find. When you find one you want to include in iGoogle, look around the page for the RSS symbol. Some sites make the RSS feed easy to find. On others, you may have to dig around. On this site, we found it at the bottom right-hand corner. Note: Some sites don’t have or don’t display an RSS feed. Once you find the RSS button or link, click on it. Then highlight the full address in the browser bar and copy it (Edit>Copy or CTRL+C), then paste into the Add feed window in iGoogle. Repeat these steps for each blog feed you wish to add to iGoogle. Are you getting the hang of it now? I’ll take you through all the steps with one more search just to make sure. 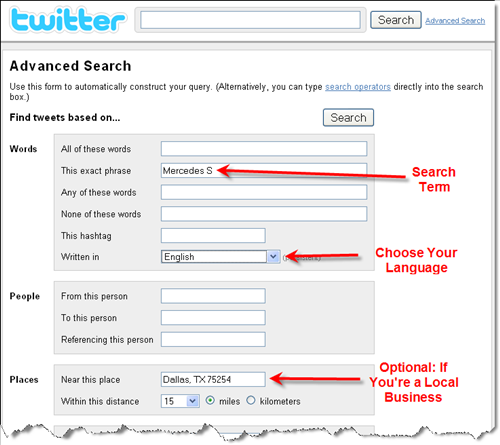 Type your search term(s) in quotes (” “) and enter any additional parameters such as language, location and Twitter hashtag. Then click Search. If you’re happy with the results, click on the RSS link (See Image Below). Highlight the full address in the browser bar and copy it (Edit>Copy or CTRL+C), then paste into the Add feed window in iGoogle. Technorati: Real-time search for blogs and other media by keyword(s). Includes popularity indexes, too. Social Mention: Social media search engine for user-generated content such as blogs, comments, bookmarks, events, news, videos, etc. TweetMeme: TweetMeme aggregates all the popular links on Twitter to determine which are most popular. It also categorizes tweets into Categories, Subcategories and Channels, and displays the number of re-tweets. Includes an overall RSS feed but not one based on an individual search. BlogPulse: Social Media statistics galore. See top links, key bloggers, top videos, top blog posts, top blogs, key phrases and top news stories. Includes RSS feed for your search. A couple of interesting stats from BlogPulse. They’ve identified over 15o million blogs. In the 24 hours preceding this post, 45,216 new blogs were launched. Digg: Has a different personality than many other social media websites although it’s changed quite a bit recently. The site is composed of content submitted by their members including links and stories, and voting and commentary. No RSS feed for individual searches but you can get the feed of their top news stories. BoardReader: Similar to some of the other social media search engines like Social Mention but also features the ability to also search online discussion forums and boards. You can get RSS feeds for each search for your listening station. This list isn’t meant to be all-inclusive. There are dozens if not hundreds of sources for feeds for your listening station. The ones on this page will cover most of what you need. However, things are constantly changing in this space and, chances are, some of these sites may not exist six months from now. If you have some favorite sources that I didn’t cover, Please share them by leaving a comment below. You should find plenty here to setup your listening station. Tomorrow, in a final segment, I’ll give you a few tips on how to customize your iGoogle page.